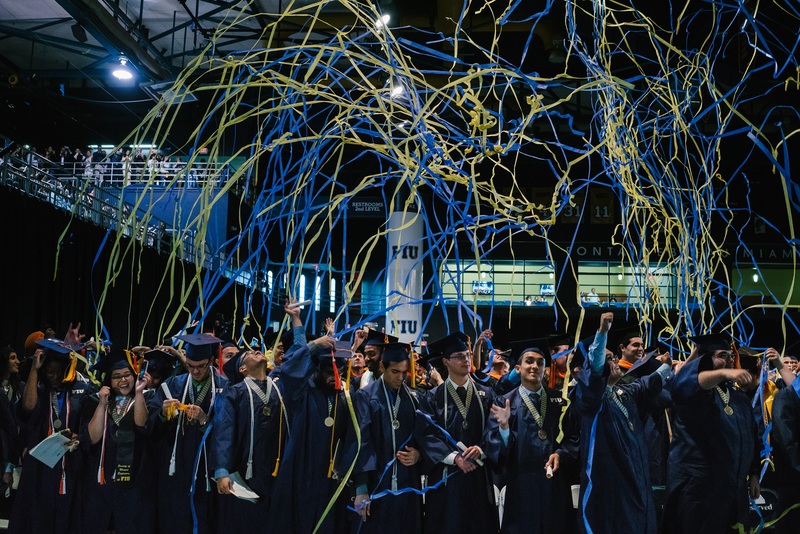 Almost 4,000 FIU students will graduate next week – many of them overcoming challenges and changing lives on their way to earning a degree. As a child, Cornelie Johnson, 31, suffered ongoing abuse. She moved out of her home as a teenager to live with a relative but soon found it was better to sleep and shower at the 24-hour grocery store where she worked. Her struggles led her to enlist in the U.S. Air Force, where she advocated for sexual assault victims. This was the genesis of her interest in social work. She will graduate with a Bachelor of Science in social work. Johnson graduates on Sunday, July 30 at 2 p.m. Meanwhile, Stephanie Padron, 28, spent much of her time on the operating table. At 18 years old, she was having her colon removed because of complications from her Crohn’s disease. She soon received yet another devastating diagnosis: Primary sclerosing cholangitis (PSC) – a chronic, long-term liver disease. She refused to let her medical issues stop her and is graduating with a Bachelor of Arts in psychology and a Bachelor of Science in criminal justice. Padron graduates on Monday, July 31 at 10 a.m.
Isaac-Ike Zadikoff, 29, was born premature with cerebral palsy and retinopathy of prematurity. He uses crutches to get around and has visual impairment that includes being legally blind in his left eye and very blind in his right. But he hasn’t let his disabilities stop him. Through an experience in counseling, he gained insight into his own life and was inspired to help people by becoming a counselor himself. He graduates with a dual track master’s degree in rehabilitation counseling and mental health counseling. Zadikoff graduates on Monday, July 31 at 3 p.m.
Jessica Chadwick, 22, is a competitive swimmer who made headlines for her heroics in 2015. She and a teammate were at John D. MacArthur State Park in North Palm Beach when they saw two swimmers caught in a rip current. Diving into action, they saved one swimmer but were unable to save the second, who drowned. Their selflessness earned them the FIU Medallion of Courage in 2015. A native of England, Chadwick was a member of the FIU swimming and diving teams that won the 2014-2015, 2015-2016 and 2016-2017 Conference USA championships. She is earning a bachelor’s degree in physical education with a focus on sport and fitness studies. Chadwick graduates on Monday, July 31 at 3 p.m.
At 15, Christa Remington, 31, joined a humanitarian trip to Haiti that would change her life forever. She met children her own age who could not attend school because their families were too poor to afford tuition or basic necessities. She knew something had to be done. Starting with 16 children in 2010, she created THE Mission Haiti to provide tuition, uniforms, shoes, books and supplies for children in the community of Cabaret. As Christa graduates with a Ph.D. in public affairs, her organization already has helped 800 children get their own education. Remington graduates on Tuesday, August 1 at 10 a.m.
For a full list of Worlds Ahead Graduates, please click here. Thanks a lot for helping the kids in my country go to school..! May God pour his blessing upon you and your family.